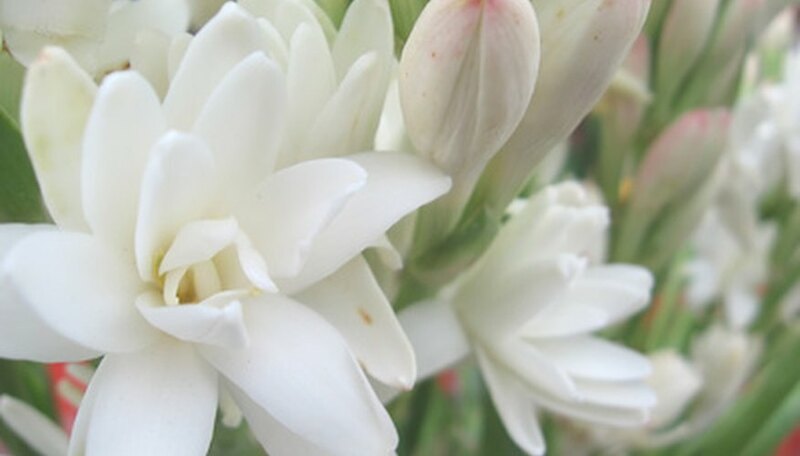 With sweet-smelling, showy white blooms, tuberose (polianthes) is a beautiful, old-fashioned addition to the flower bed. The tuberose plant, which is easily grown from bulbs planted in late spring, will reach 2 feet in height at maturity and the waxy double blooms will appear in autumn. Tuberose blooms can be cut and used to create floral arrangements. Plant tuberose bulbs in a sunny location in soil that drains well. Tuberose bulbs grow in clumps, which should be spaced 8 to 10 inches apart. Water the area generously. You should see growth in two to four weeks. Keep the soil moist throughout spring and summer. Fertilize tuberose plants every other week during spring and summer using a balanced liquid fertilizer, such as 8-8-8. Apply the fertilizer according to the directions. Cut tuberose for flower arrangements as often as desired. Keeping the blooms clipped will encourage the plant to continue blooming. Remove foliage from the plant when it turns yellow and dies down in autumn. Don't remove the foliage while it's still green as the leaves provide nutrients so the bulbs can grow the following year. Dig up the bulbs with a spade or garden fork just before the first frost. Dig several inches away from the plant to avoid cutting into the bulbs. Brush excess dirt off the bulbs and lay them in a cool, dry place for one to two weeks or until the bulbs feel dry to the touch. Place the tuberose bulbs in a cardboard box filled with peat moss. Store the box where the temperatures will be maintained between 45 to 50 degrees Fahrenheit and never allow the temperature to drop below 40 degrees Fahrenheit.